Note: .column-right-inner is the right sidebar class. 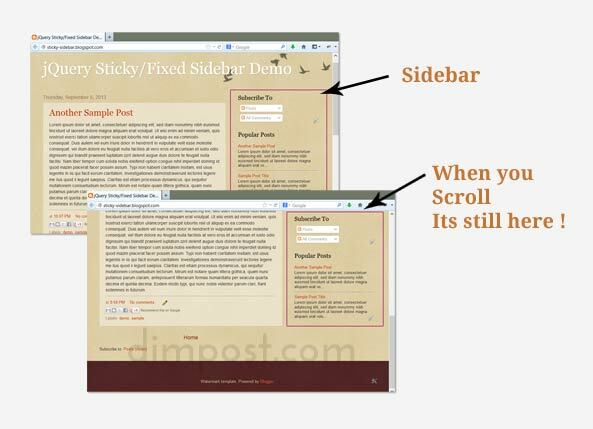 If you want to make sticky a left sidebar then replace all those class with .column-left-inner from the jQuery code. And topPadding = 15; change the value if you need to increase/decrease space on top of the sidebar. For example, you could make an AdSense Ads widget stycky which stick around with visitors. Don't forget to say thanks. Do you want to know anything else about this ? Don't hesitate to ask. Thank you very much for making such an easy article with this topic. It's really enjoyable and helpful. well thank you for your effort, but this didn't work for me... i even looked for a .column-right-inner class but didn't find it in my blog's html. so the right sidebar class must be named something else and i can't find it cause i'm not very good with HTML language ! but i want to know what happens when i find mi right sidebar class and replace it in each .column-right-inner phrase used in the code you gave us ? everything will worf fine ? nice trick. how to add two widget id, ex HTML4 and HTML5? good for any ads on blog..
Hey, this worked well for me, but now not all of my sidebar is visible because it stays at its original height on the page (in line with my posts). I want it up top, so that it starts in line with my header. How do I do this? I will also probably have to shorten the width of my menu bar, and again, don't know how. Any help would be MUCH appreciated. Thanks so much. Well. My question is how to fix the page? I mean the Page widget under the header. Thanks.